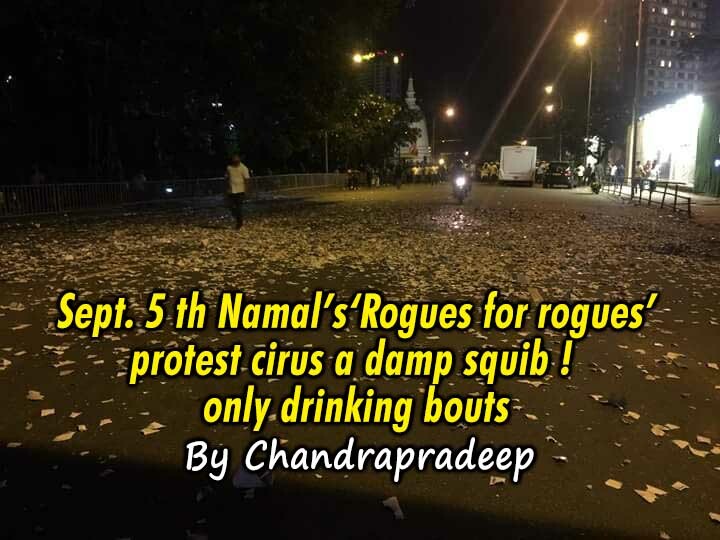 (Lanka e News - 07.Sep.2018, 4.15PM) The so called ‘Jana bala’ protest staged on September 5 th by the corrupt and crooked Rajapkse family with a view to ‘baptize’ Namal Rajapkse as the future leader , as well as to frighten the judges who are hearing the cases against the countless rogues including the Rajapakses of the corrupt Rajapakses’ nefarious decade turned out to be a damp squib. Like how it started from nowhere it ended there without achievement of any aim or objective . This protest which was better known as a ‘rogues for rogues ‘ campaign or ‘Horunge Rasthiyaduwa’ while promising , ‘to overthrow the government tomorrow’ turned out to be a total fiasco. The ‘rogues for rogues ‘ who bragged that they would get down 200, 000 people to Colombo to join their ‘Jana bala’ alias ‘Horunge rasthiyaduwa’ in order to surround the parliament , Temple Trees and cripple the activities in Colombo , finally could not but admit only about 100 000 people came to Colombo. Though they said they would see to it the present government will be packed home ,it is those who participated in the protests who went home crestfallen. The Machiavellian mendacious Rajapakses who conspired to create mayhem by sacrificing a life brutally , and blame it on the government could not implement the gory plan because this conspiracy was exposed ahead. A fiasco- confirmed beyond doubt…. According to Police intelligence reports , only about 30,000 people could be got down to Colombo in this protest campaign organized by Namal. Though the original plan was to transport the crowd in buses numbering over thousand , only 275 bus loads of people arrived. Diplomatic divisions said , about 20000 to 25000 people congregated. No matter what , it is common knowledge only a maximum of about 5000 people assembled near the Lake House .Namal Rajapakse and clan chose the Lake House roundabout to hold their meeting . Owing to this the venue got crowded , while many of his other Rajapakse vagrants were enjoying- eating and drinking on the by roads thereby creating road blocks. Finally Namal ‘s clan could not hold a proper rally. Truly speaking they were unable to get even a fraction of the crowd they could muster at the last May day rally. This was because the hope of the party supporters that Mahinda will be the prime minister if the ‘Bud’ won at the local government elections, had by now completely evaporated. . Namal’s action destroyed even the strength of the anti government Rajapakse groups like dashing coconuts on the ground . All what Namal could succeed was getting down this crowd to Colombo and sending them back aimlessly without any worthy message to the masses from the leaders , and simply saying ‘cheerio ‘ to the people , thereby proving how incapable he is as an organizer. His so called sympathizers were only transported to and fro , and they went back like cattle that were transported to Colombo , but rejected and sent back . At the concluded rally they could not even erect a stage with a lorry base. Except a mega phone they could not use even a buffel fixed on the diki of the motor vehicle . Their megalomaniac leader Mahinda Rajapakse could not even silence the crowd to make his public address only to fade away without making a speech . Their loud and proud threats that they would lay siege to government Institutions were unavailing .No government nerve center was surrounded ,nor could they convey any worthwhile message to the government Though they were to protest throughout the night , only the kasippu drinkers and their thovil dancing was witnessed at the Lake House roundabout. There was nothing politically achieved. About 2000 to 2500 were to remain back throughout the night, yet by midnight the entire protest circus was over , and the clowns did the vanishing trick . They fled without their gowns as soon as the midnight hour struck. If a huge crowd (though there wasn’t such a crowd) is to be got down to Colombo by the opposition with the objective to pressurize and topple the government , there must be valid reasons , not liquor bottles and hired vagrants. Either the government should have committed a grave wrong against the people, or there must be something that stimulates the people’s enthusiasm targeting a forthcoming election .This damp squib had none of these aims. The whole objective and motive of this protest was to disentangle the knotted conflicts within the Rajapakses’ leadership. In the end , the entire exercise ended where it began without reaching any goal – starting from nowhere it only got there ! It is the chief organizer Namal who brought together all the drunkards . Hence he must be ashamed of himself . He being not a drunkard , at least in the maiden effort to baptize to make him the future leader he could have seen to it his maiden effort is carried out decently and respectably (his rackets and perfidies notwithstanding). He could have learnt a lesson from Late R. Premadasa’s life at least because Namal can never learn anything virtuous from his own Rajapakses. Premadasa who was born to low society parents adhered to his sobriety and sanity all along, and tried to build a virtuous society free from inebriation.. There never had been anyone who could muster crowds as did he . And it is the low society people of the cities who participated in his campaigns. Though certainly it Is not possible to muster a completely sober crowd , as a disciplined leader setting an example to others he made sure insobriety is not encouraged,. This was best illustrated during his entire Gam Udawa program shows which were conducted every fortnight. He completely forbid liquor consumption though some drank on the sly. Hence Premadasa could curb and control inebriation and drunken behavior. Therefore it is only an individual having no people’s support who will resort to gatherng crowd by providing liquor and arrack as inducements. One participant of the ‘rogues for rogues’ (horunge rasthiyaduwa) , took ill and while being transported to the hospital died in the Suwaseriya ambulance. He was a heart patient , reports say. In all there were 105 casualties transported by ambulances and other vehicles to the hospital . They had become sick following consumption of liquor and had fallen down at various points , and due to food poisoning. The irony of ironies is , it is the Rajapakses who screamed and shouted against the Suwaseriya ambulances when the government introduced them for the benefit of patients , and now it is the same Suwaseriya services that came to their rescue. A politician no matter how opportunistic he is , should not oppose a good project of a government. It is hoped the Rajapakses are intelligent and intelligible enough to realize this at least now, and will turn over new leaf. .
A most important salient political point must be made known before concluding this article. During Namal’s entire campaign just one slogan ‘we want a government – Mahinda government ‘ was all that was heard. If that is the one and only objective , without wasting national wealth and without making the people to suffer on the roads , Mahinda Rajapakse could have resorted to one simple thing . :H e can topple the government 6 months before its full term is completed , and take over the reins. That is by a political methodology strengthening the country’s Democracy. The methodology is simple , the members of the Alliance including Rajapakse supporting the 20 th amendment tabled by the JVP in parliament , and providing the two third majorityin parliament . Unbelievably only Mahinda’s groups which are not supporting it at present. All the other parties are in support. If the 20 th amendment is given support , there will be no executive president appointed on the votes of the people. It will only be a president sans executive powers appointed by parliament .In that case the present power pickle would be over , and the powers will be vested with the parliament and prime minister will be the head. In that event instead of the scheduled presidential elections on 2020 -01-08 it will be the general elections. It cannot be forgotten , Mahinda lent support to the 19 th amendment . He supported that while he had 140 members with him and had the majority , also cannot be forgotten. Hence ‘if they want ‘ a government and a Mahinda’s government’ what they should do is , support the 20 th amendment ,and do their best to form a Mahinda government on 2020-01-09 ,shouldn’t they ? There is nothing militating against that. Based on what theory can one say , when the next government is being formed Ranil Wickremesinghe of the UNP will be the prime minister again . Without following that what are the Rajapakses trying to demonstrate and accomplish ? I t is therefore crystal clear they want not only a Rajapakse government but a ‘despotic government’ which existed during the Rajapakse corrupt nefarious decade. They want a corrupt despotic regime again and not the power under any circumstances which would render them accountable to the parliament . We who are for genuine patriotism swear hereby , never will the plans and plots of Rajapakses work .There is no room for a dictator to rear his head again even if Namal gets crowds down to Colombo until his hair has turned gray and makes them roam the streets while performing his own clownish acts .